Planning a trip to Italy? 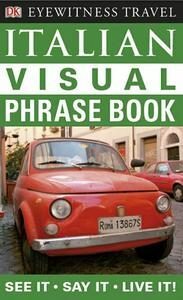 The Eyewitness Travel Guides: Italian Visual Phrase Book can help you start learning Italian today. Whether you’re visiting Italy for business or pleasure, learn how to speak Italian with essential words and phrases for hundreds of illustrated everyday objects. Find key phrases fast: galleries of words and pictures make it easy to find key basic vocabulary at a glance and help you remember what you’ve seen. Learn phrases to help you find your way around, eat out, shop and go sightseeing. An easy-to-use pronunciation guide for every word and phrase will help you speak like a native. Perfect for business travelers, students, or tourists. Combining the best of DK’s visual approaches to learning languages, DK’s Visual Phrase Books teach phrases that are essential for successfully navigating a foreign country.